WASHINGTON (AP) — The U.S. is open for talks without preconditions with nuclear North Korea, Vice President Mike Pence has declared, subtly shifting White House policy after Olympics-inspired gestures of respect between the rival Koreas. That provides a little more leverage for South Korea in its path-finding outreach to the North and could reduce potential strains in the U.S.-South Korean alliance. But diplomacy between Washington and Pyongyang won’t start unless Kim Jong Un wants it to. While the North Korean dictator, who has yet to meet a foreign leader, has invited the South Korean president for a rare summit, Kim has given no sign of being ready to talk to the U.S.
A back channel of diplomatic communication between North Korea and the State Department has remained open since President Donald Trump took office a year ago, but the only substantive talks reported to date were in the first half of last year over the fate of several Americans in North Korean custody. The North has refused to negotiate over its nuclear weapons as it nears its goal of being able to launch an atomic-tipped missile that could strike the U.S. mainland. Trump views those weapons as America’s primary national security threat. His administration’s 2019 budget, released Monday, includes hundreds of millions dollars more for missile defense, adding 20 strategic interceptors in Alaska to protect against long-range, North Korean projectiles. Meanwhile, Pence is making clear that the U.S. will keep escalating sanctions pressure on the North until it takes clear steps toward giving up its nukes. But at the same time, Pence signaled more openness to engagement with Pyongyang. 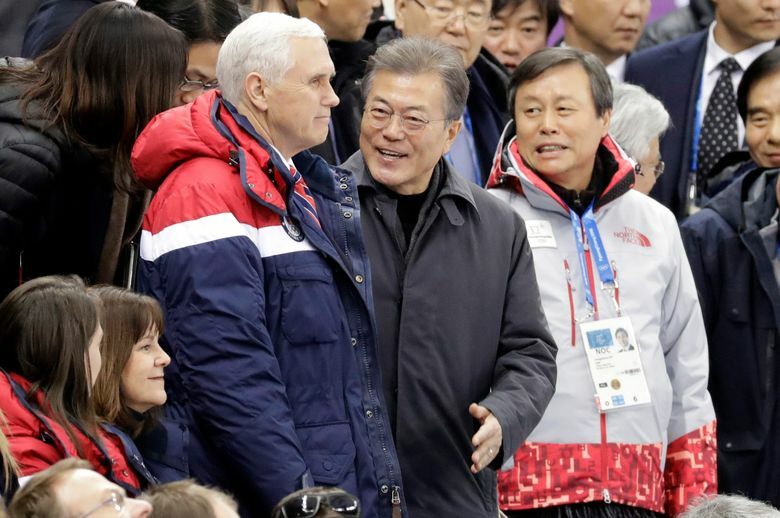 That’s a marked departure from the uncompromising message that Pence delivered at every public stop on his trip, when he repeatedly assailed North Korea on human rights and nuclear provocations, and threw cold water on South Korean President Moon Jae-in’s outreach to the North by snubbing its delegation at the games. Evans Revere, a former senior State Department official for East Asia, voiced surprise over Pence’s remarks, noting that as recently as December the White House pulled the plug on Secretary of State Rex Tillerson’s public advocacy of unconditional talks to test the water with North Korea. Pence’s office said that didn’t reflect a shift in Trump administration policy, as the president has previously expressed openness to talks, nor a reduction in U.S. concerns over North Korea’s provocative behavior. Tillerson’s response to Pence’s comments was guarded. He said “it’s too early to judge” whether a diplomatic process could be starting and made clear the obstacle to progress is Kim. “It’s really up to the North Koreans to decide when they’re ready to engage with us in a sincere way, a meaningful way,” Tillerson told reporters in Egypt. He reiterated his view that there would need to be exploratory talks to determine whether the North Koreans are ready for “meaningful” negotiations. During his turbulent first year in office, Trump has vacillated between issuing dire threats of military action and offers to talk if the conditions are right. But at least in his public commentary, he’s been broadly supportive of Moon’s diplomatic initiative, claiming that the “maximum pressure” strategy was what drove North Korea to engage with the South. Now Moon faces a heavy lift in trying to translate that into progress on the nuclear issue that preoccupies Washington. Though Moon clearly favors a policy of engagement with the North, and likely views that a possibly defining issue of his own presidency, he didn’t immediately accept the offer of a summit in Pyongyang after it was conveyed in person by the North Korean leader’s sister Kim Yo Jong who attended the Olympics opening. Moon said the Koreas should create an environment so that the first inter-Korean summit since 2007 could take place. He also called for quick resumption of dialogue between North Korea and the United States, reflecting an awareness that making nice with the North could alienate an American ally critical to the defense of the South. U.S. officials doubt that Moon would agree to a summit with Kim without the contours in place of how to move forward on denuclearization, but Revere said the U.S. government remains concerned that North Korea could exploit Moon’s diplomacy to advance its agenda of being accepted as a nuclear weapons state. Revere said a quiet conversation between personal representatives of the U.S. and North Korean leaders could help ward off a confrontation in the coming months, and gauge whether there’s a basis for starting formal negotiations. The hurdles, however, remain high. North Korea would likely seek relief from sanctions, which Pence says won’t happen without action on denuclearization. The North would also want an end to the U.S.-South Korean military exercises that were suspended for the duration of the Olympics but which are expected to resume next month. That’s another step that the Trump administration has so far shown no interest in taking.